Mix all ingredients thoroughly. Store in refrigerator in tightly sealed container. To use: Stir mix before each use. Mix one heaping 1/3 cup with 1/3 cup water. Stir well and allow to stand for a few minutes to thicken. If desired, add up to 1/2 cup finely chopped quick-cooking vegetables, such as spinach, kale, roasted red pepper, kalamata olives, or tomatoes, to the batter. You may also add pre-cooked ingredients, such as mushrooms or broccoli, as long as they are chopped small. If the batter seems too thick (thicker than pancake batter), add water a little at a time until thinned. Heat a non-stick pan over medium-high heat until a drop of water sizzles. Spoon in half of the batter and spread it evenly in a circle approximately 4 to 5-inches in diameter. You want it to be on the thin side rather than thick. Cover the pan and cook, checking often, until the top is no longer shiny wet looking and the underside is light to medium brown (lift a corner with a spatula to check). Flip over and cook the other side, with the lid on, for another minute or two. Make sure that the center isn’t uncooked (raw chickpea flour tastes BAD). Place on plate and keep warm until ready to serve. Repeat with remaining batter. 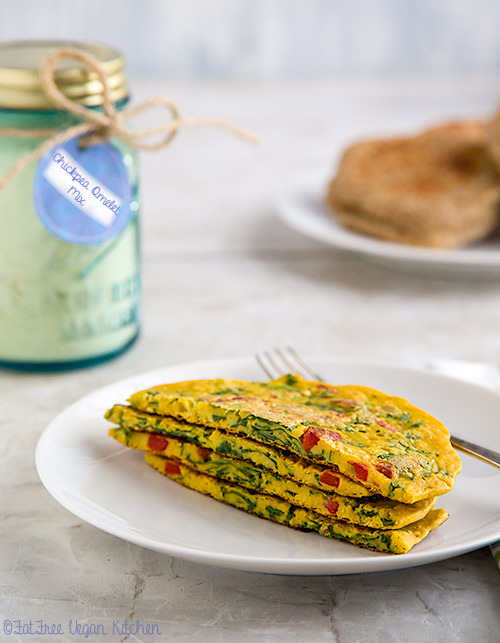 Two omelets equals 1 serving or 1/3 cup of mix.